The left list box holds a list of all currently configured custom Stamps. Clicking on an item makes its values appear in the other boxes on the form. IMPORTANT CHANGE. As of v3.6.0, Stamps apply complete actions (see below). When upgrading, existing stamps will still function. However, stamps created in v3.6.0+ may not function correctly if used in older version of of Tinderbox. Set attributes work very well with stamps. Note especially that stamp actions can add, remove, and toggle set members. sets the value of Pets to contain exactly two pets. takes the current value of Pets, adds dog if it is not already a member, and removes hamster if it is a member. The Name box shows the name of the currently selected Stamp. It is the also the name as seen listed in the Value Menu. The name can be changed. The Delete button deletes the currently selected Stamp (without further warning). The Change button allows the changing of existing Stamps or the addition of new ones. To change a Stamp, select it, change the values and click the Change button. The add a new stamp, deselect all the existing Stamps and add data for the new Stamp, then click the Change button. 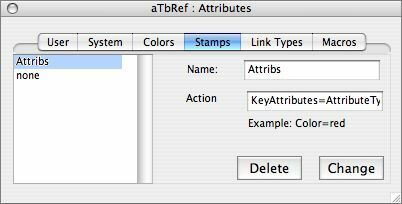 using a stamp to include spaces, tabs, or new lines in a string attribute. using a stamp to set the Text, where the new text contains paragraph breaks. See the Release Notes for more technical detail for how the XML has been changed.